Hats off to Captured by Porches Brewing Company for entering the retail market with returnable bottles. I picked up a bottle of CBP's Friday Rye Ale at Beermongers a couple days ago; their flagship Invasive Species IPA is also on the shelves. It's a nice bottle, a 750 ml swing-top; the deposit is $1.00 per bottle. According to CBP's blog, making bottles out of recycled glass is only 30% more energy efficient than making them from raw materials. So the effort to reuse bottles is a welcome return to common sense. That's all well and good, but if the beer isn't any good, then who cares? I'm happy to report that the bottle-conditioned Friday Rye Ale is really well done. It's tangy and hoppy, with a dry bitterness that lingers on the tongue. The bottle I had was super effervescent at first -- it didn't pour with a huge head, but the bottle opened with a loud pop, and the first sips filled my mouth with very fizzy fine bubbles. The night before I had a Wry Pale Ale at Laurelwood -- very tasty, by the way -- and the Friday was at least as good as that, maybe even a little better. The bottles are priced near the low end of the bomber range -- $3.80 at Beermongers -- but because they are a little bigger than 22-ounce bombers, they have a cheaper SPE of $10.79 compared to $12.44 for a bomber of the same price. I'd be happier if the price was closer to six-pack price, but it's a start. I'm glad I wasn't the only one not sold on CBP's IPA, my first go round. Everyone is raving about this beer, but I was not immediately impressed. I'll have to give it another shot. I enjoy rye ales as well, so I'll have to give this one a shot. I had the Invasive Species IPA last week from a similar 'returnable' bottle. The IPA does have a unique floral aroma / fruity flavor up front, and the bite isn't as big as I'd like - but overall, I thought it was a pretty good beer. 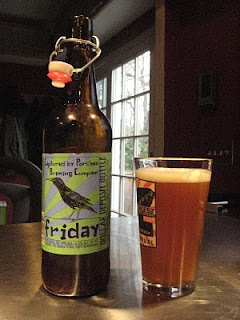 I'll be looking to try CBP's Friday Rye ale sometime soon. Good to hear that CBP's beer is getting better. I too was scared away from their beer in the past by lack of constancy. Sounds like the new facility and brewing system has change things for the better. As always, thanks for the report Bill! Hmmmmm....I don't know what to do. I tried the IPA in the returnable bottle a couple of weeks ago because others said they liked it, even though I haven't enjoyed their beers on tap in the past. I didn't care for it. Now you say this rye ale is tasty. Dare I try CPB again? Well, Jason, here's DoSir's review of the bottled IPA, he says it's off. So, buyer beware. I'll give the IPA a try, just so I can say I have. The Rye is sound, though. Yeah I think the saying whatever beer you are drinking at the time is your favorite is doubly true with IPA's. When I worked at Belmont Station it didnt matter what the beer (ipa) tasted like too many people it was always amazing. Never liked CBP much. I think people were more turned on by the story of how they came to be and the whole sustainable aspect then anything. That said I am more then happy to give them a shot and the returnable bottles are a great idea. I have heard many retail and brewers talk about that idea but werent sure they could implement it. Dosir is a little off himself so I take that with a grain of salt. I've been meaning to thank you for suggesting the Beer Mongers-I like their store a lot. @grotusque: Yeah, it's got a good vibe. It's nice that they made a strong start, it bodes well for them. But I think you would have found Beermongers without my help.